as a finishing touch, nomad clan included the flint public art project director’s carriage town residence, nestled between the classic car and the reader’s blanket. it acknowledges the hospitality of our hosts and celebrates the home we shared together that week. nomad clan step back to examine their work in progress with a flint resident, one of many who would visit totem books during the weeklong project. unfazed by the downpour, australian born artist david ‘meggs’ hooke adds finishing touches to his mural for totem books in flint. 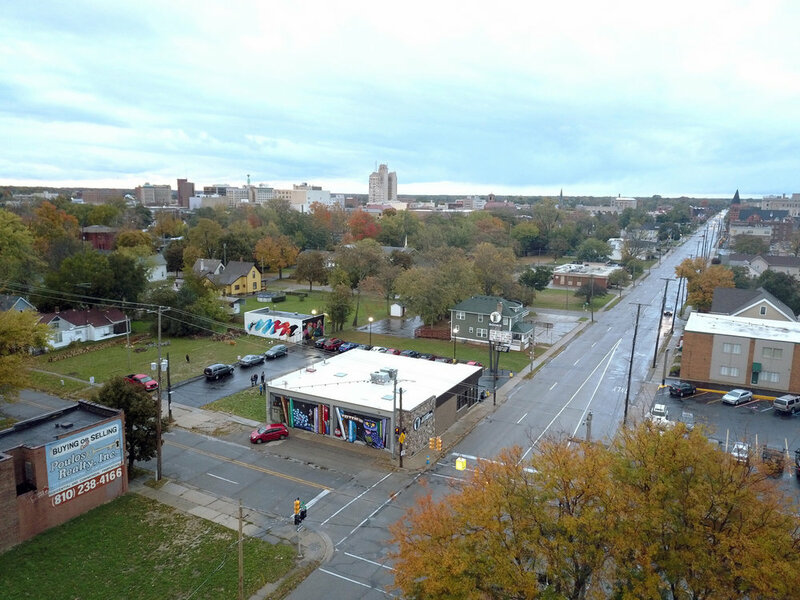 storm clouds cast a trace rainbow over the flint skyline as meggs continues his piece. flint public art project executive director joe schipani regards with approval. brazilian artist and graffiti legend, binho ribeiro adds finishing details to his literary themed mural at totem books. 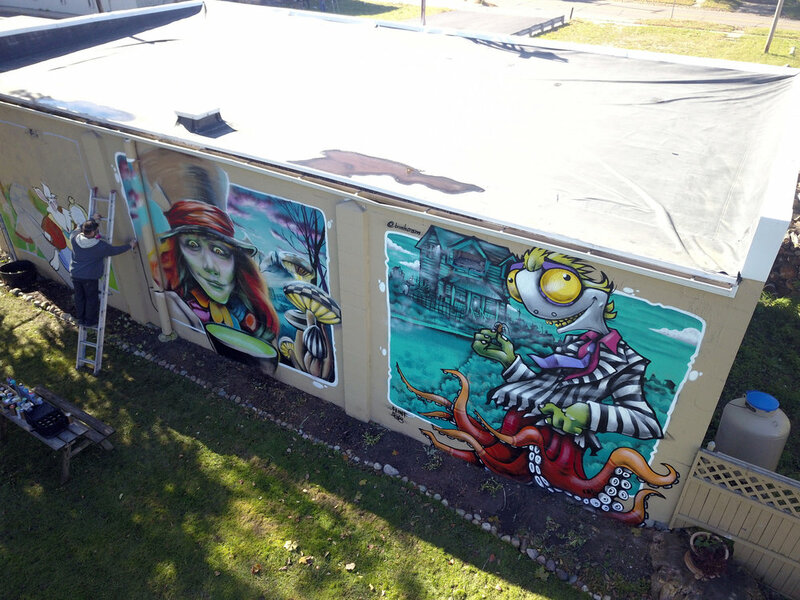 totem books’ neighbor provided access to their private yard so charles boike, kevin ‘scraps’ burdick + binho ribiero could adorn the book warehouse with narrative character murals. nestled in the heart of the community, totem books now brightens the neighborhood landscape with its vibrant murals. flint muralist charles boike takes a break from painting to introduce his daughter to the nomad clan. the flint fam gathers post rainfall to finish painting and documenting the new mural. from left to right: joe schipani, hayley '“aylo” garner, kevin “scraps” burdick, zippy downing, christopher mcgeorge, trevor norman + joy “cbloxx” gillead. on october 16, 2018, i stepped off the jetway at flint-bishop airport on a brisk fall morning rocking red flip flops and a t-shirt--perfectly suitable attire for my departure city of los angeles. joe schipani, our perpetually jovial host and director of flint public art project, greeted me outside. garbed in flint-appropriate attire, he was wrapped in a lined leather jacket, a hoodie, and a winter hat. despite my northern michigan upbringing, i was clearly unprepared for flint. but it was more than the change in temperature that would ultimately surprise me. with smile on face and song in heart, joe loaded up our bags and whisked us away to his carriage town residence where we were greeted by his husband phillip, a platoon of cuddly canines, and a clowder of cats. zippy and joe returned to the airport to gather hayley and joy of nomad clan—a rad duo from manchester, england. a friendship sparked over instagram, it was the first time we met in person. over the next week we giggled in our rooms late into the night as our virtual friendship was made real. we traded sips of whiskey until well past bedtime while chatting about inspiration, injustice, and the aesthetic merit of stranger things. hayley resurrected the lost art of freestyle bmx as we traversed the city and became inspired by flint and its people. over the next week, nomad clan quickly set out gathering information and inspiration for the artwork they would create in honor of flint. engaging the community with a genuine ease, the manchester duo met local residents, listened intently to their stories, visited high school art classes, and dove headlong into their research of flint’s intriguingly complex history. 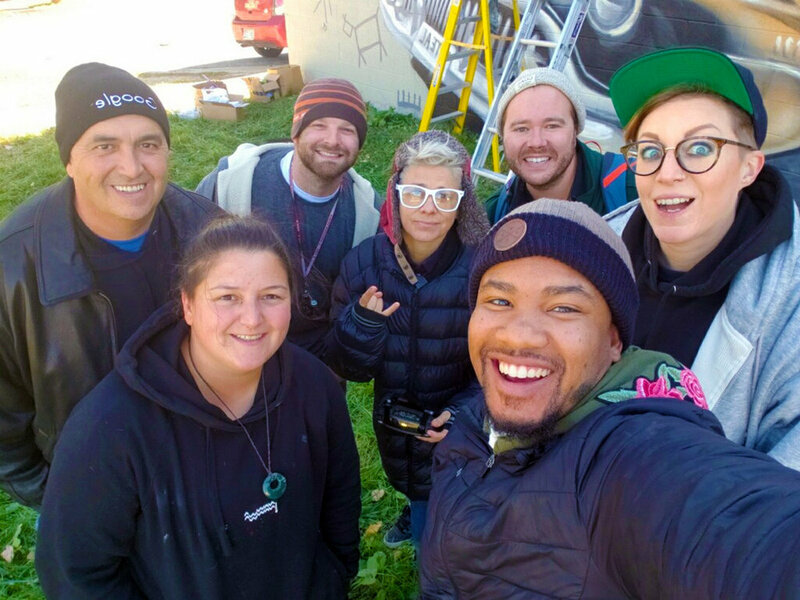 as local excitement grew, the nomads volunteered to paint another mural for flint fresh, a non-profit community organization dedicated to making fresh, local food affordable and accessible for flint residents. working with flint muralist kevin “scraps” burdick, hayley and joy set about painting fresh produce in the warehouse where the vegetables are processed before being distributed to the community. on saturday totem books hosted a mural jam. totem books is a magical place on the corners of w court and ann arbor streets. a used book and vinyl store, they’re also a café and have become a sort of community center. from children’s story time and adult crafting meetings to drag shows and a developing support group for domestic violence survivors, totem is a place that gathers people together and lifts them up. as the murals progressed, the exterior of totem books began to reflect the community contributions that regularly take place within. scraps and fellow flint muralist charles boike joined nomad clan and brazilian artist binho ribeiro, along with freddy diaz and david ‘meggs’ hooke representing for nearby detroit. community members gathered, honked in support as they drove by, and brought their children to meet the artists and see the works in progress. in nomad clan’s mural, a reader huddles under a blanket, flashlight in hand. binho created a bookshelf of novels accompanied by an owl—a recurring character in his art. charlie and scraps painted scenes from alice in wonderland. freddy diaz contributed a dia de los muertos inspired musical skeleton while meggs painted a wave of color in his signature style. that evening, with the murals complete, we sipped wine at an opening event hosted by totem. i watched as the neighborhood gathered within those painted walls and celebrated not only the art, but also one another. all of the artists created something beautiful, were conceptually clever, and showcased their technical abilities. but the series of murals was ultimately about demonstrating care for the community. sandra branch, a founding member of flint public art project, told the moving story of a friend and local resident undergoing cancer treatment. upon learning of the murals in progress, branch’s friend requested to be driven by totem books on her way to chemotherapy. the art, for her, was a sign of flint’s recovery—and perhaps also her own. in homage to this resident, the nomad clan incorporated her name into their mural. i still get the chills thinking about this moment—where people from around the world gathered on a rainy fall day to celebrate community through art. a painting may not change the world, but it can change an outlook, brighten a day, and bring people together. it promises an ethics of care, support, and community. i’m glad to see that spark in flint and humbled to have been a part of the magic.